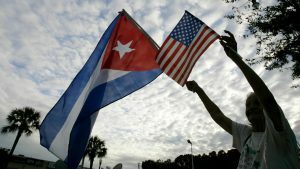 If you don’t know much more than the basics concerning the relationship between Cuba and the United States then you may be under the impression that they must not like us very much. Realistically, if someone embargoed my country from the rest of the world and, therefore, left me with extremely limited resources, I’d be pretty upset, too. And then there was the various coup attempts and the incident where the U.S tried hiding the fact that we were spying on Cuba via aircraft, though it was obvious it had been happening. Clearly there is a laundry list of reasons why Cubans may not love America. In addition to this, it doesn’t seem like the leaders of these two countries see eye to eye. We have extremely different systems of government, public policies, and systems of belief. And I’m not too sure that the saying “opposites attract” really applies to governments. However, the way Cubans feel about Americans proved to be much different than to be expected. Through my experiences, I found that Cubans are more than welcoming to all Americans. Many of them have family members or close friends that live in America, so they feel that creates a bridge of commonality between our two countries. They also love things like American baseball, so if you’re willing to engage in a conversation about it then you might find you have a line of people waiting to discuss it with you. Most importantly, they do not blame the American people for the words or actions of government leaders. Cubans are very good at recognizing the fact that not everyone in America believes the things their President says. Even if they did, a Cuban would love to spark a healthy debate over politics. And that’s all they want! They aren’t in the business to berate anyone for their beliefs or try to persuade them for or against anything. They just love to speak and discuss ad share ideas. It’s a small island, so getting to talk to foreigners is fun for them. Not only to discuss the country of the foreigner, which in our case was the United States, but because they are so proud of their culture and want to share it. I wrote in a separate blog about how much pride they have for their country because of how obvious it was to me. I think it seemed so apparent because of how enthusiastic they all were to share and explain their typical world to us. 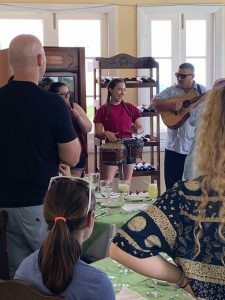 They loved to include us in their cuisine, music, history, and dance. There was not a moment where I didn’t feel totally welcome in Cuba. 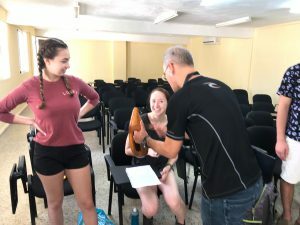 In fact, there were many instances in which various Cubans highly encouraged all of us to come back and convince as many people as we could to come as well. This is because all Cubans want is to be understood as a people, so the more Americans who come to see the real Cuba, the better. The consensus was that Cuban people love Americans! They love American culture and sports, too. All they want is to share their culture with us, as well, with no intent to push their ideals on us. They just want better representation on the world stage than they have right now. And the change starts with the crossing of borders, so if you are considering finding a way to visit Cuba, I would highly encourage you to go. You won’t travel to another place where you are more welcomed with open arms as intensely as you are in Cuba. This entry was posted in Uncategorized by corrina_quaglietta@student.uml.edu. Bookmark the permalink.